John W. Ripley, "Another Look at the Rev. Charles M. Sheldon's Christian Daily Newspaper," p. 1. Paul Wallace Gates, "Land and Credit Problems in Underdeveloped Kansas," p. 41. B. B. Chapman, "The Land Run of 1893, As Seen at Kiowa," p. 67. The Annual Meeting, p. 76. Bypaths of Kansas History, p. 101. Kansas History as Published in the Press, p. 103. Kansas Historical Notes, p. 110. A scene from the lantern slide photoplay adaptation of the Rev. Mr. Charles M. Sheldon's famous novel, In His Steps. Here, the managing editor of the Raymond Daily News confronts the owner-editor (left) with a warning that the paper is headed for bankruptcy if he continues to publish it as a Christian daily. 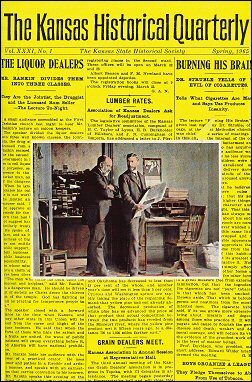 The backgound printing is a portion of p. 4 of Sheldon's actual Christian daily edition of the Topeka Daily Capital of March 15, 1900, an experiment that was inspired by the fictional Raymond Daily News. Several authorities believe that the 150-slide series illustrating In His Steps, made in 1900, and owned by John W. Ripley, author of the feature article beginning on p. 1, represents the first photoplay adaptation of a best seller.